The best part - It is FREE - Never Expires. No Nag screens. * Need more than 100 MB? Free Encryption Software to protect your confidential data on Any Windows PC, Desktop, Laptop, Hard Disk or Removable Drive such as USB Flash Drive, Memory Stick. Secure your data and ensure absolute privacy with Cypherix's, Cryptainer LE. It's powerful 448 bit encryption, creates multiple 100 MB encrypted drives (vaults) on your hard disk. These encrypted disk drives can be loaded and unloaded when needed. 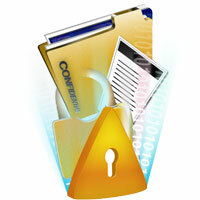 You can view, modify and hide all types of files with a single password. Cryptainer LE can be installed directly on a USB / removable drive as a "stand alone" install. One can carry this installation of Cryptainer ('Cryptainer Mobile') to different machines without having to install Cryptainer on the host machine. You can protect your files and folders and ensure total privacy with Cryptainer LE. Simply drag and drop the files and folders you want to hide and voilà! Your files are hidden. With Cryptainer LE you can hide the very existence of your confidential files and folders. Cryptainer LE free encryption software is a comprehensive solution to encrypt any data, any disk, drive, file, folder on Any Windows PC. It has a very Simple, Easy-to-use interface to encrypt and decrypt files on the fly. It allows you total privacy and security without changing the way you work. Cryptainer LE creates unlimited number of encrypted drives on your hard disk that appear as Real Drives in Windows. It functions like any other regular drive on your computer. Cryptainer LE is fast. You will barely notice the difference in speed as compared to a regular "Copy Paste" function. Cryptainer LE allows to create encrypted disk drives on removable media. This allows for the flexibility to store and port data on removable media like Zip disks, tape drives, external drives (Flash Disks, USB drives, pen drives). It also allows users to Password Protect Folders, Files on CD ROMs, DVD's. Cut, copy, paste, new file/folder creation, etc., can be used within the encrypted disk drive. Cryptainer LE's interface is extremely easy to use and requires no learning at the user's end. Cryptainer LE free encryption software works with all 32 bit as well as 64 bit versions of Windows including Windows 95, 98, ME, 2000, 2003 Server, XP, Vista, Windows 7, Windows 8.1, Windows 10 as well as MS Windows supported file systems like FAT, FAT12, FAT32, NTFS, NTFS with EFS, etc.